Our Newest Solid Gutter Protection System. E-Z-Gutter’s steel screen products are made from .028 expanded galvanized steel that is powder-coated with Midwest Enterprises’ own proprietary powder for maximum durability. Steel screen gutter guards are available with either medium or small holes, and are ideal for medium to heavy debris loads. Excellent for locations where salt spray and other extreme environments cause other products to corrode. Powder-coated aluminum can handle the heaviest debris loads, or mill-finish can be used in applications where a lighter-duty guard is appropriate. Our aluminum solid, perforated or louvered gutter covers provide the best protection from the elements. These covers are designed for medium to heavy duty debris loads, and are available in a variety of colors. 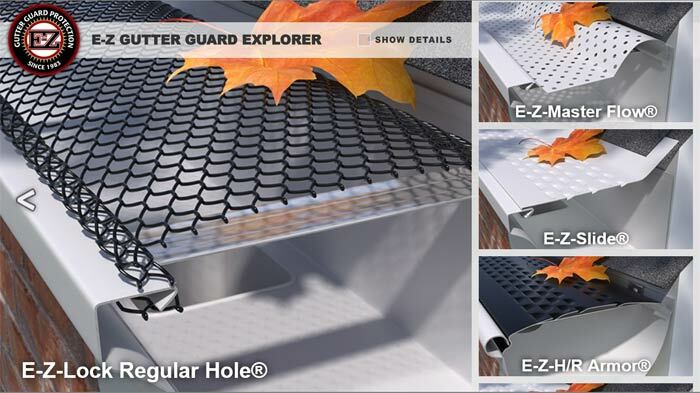 Take a digital cruise along the wide variety of different gutter guards we offer here at E-Z Gutter. Whether you are looking for Solid Covers, Mesh Screens or Powder-Coated Mesh Screens, you’ll find all our styles of guards with all the details. My name is Tim Kurtz owner and operator of Kurtz Exteriors LLC in St. Louis MO and my crews and myself have been installing E-Z-GUTTER GUARDS for 15 plus years and love them as well as our customers. We have installed miles of E-Z products with no call backs, continue to make awesome products! Although we are primarily a roofing company, we are often asked to install gutter protection on our jobs. After trying others, we've only been using E-Z Under Gutter Screen for the last three years. Its a very easy product to install and we can trust any of our installers, from rookies to journeymen, to get a perfect fit every time. The powder coated steel is extremely durable for gutter protection, the powder coating gives a long lasting, great finish and fitting E-Z under between the shingles and the eave insures that our roof job looks great next to it. There is no other gutter protection I would want to use! We have been using your product for years. It installs with ease and works like a charm! We have had no customer complaints. I have it on my personal home and several of my employees have it also. It makes home maintenance easier. I have been installing E-Z-Gutter Guards for several years now and my customers appreciate them. While there are many guards on on the market, I have yet to find anyone that has a product selection that can beat the quality and price. No matter what type of debris or roof you have, there is an option that will work great for your home at a great price. One common example is that customers get prices 3 or 4 times higher for a different product that can't handle heavy rain falls while still keeping out debris. Once I give them a price, they immediately say yes and have always been happy with the results.